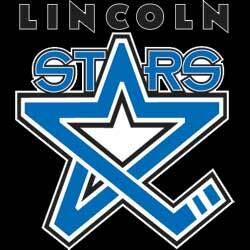 The Lincoln Stars fell just short tonight of winning their fifth straight game with a 3-2 road loss to the Omaha Lancers in Ralston, NE. Click here to view the Pointstreak boxscore. The loss dropped the Stars to 37-22-3 (77 points), but they are still in third place in the USHL Western Conference. However, the Waterloo Blackhawks won tonight, so now they are only one point behind Lincoln in the standings. The Stars have two games remaining, and the Blackhawks have three. Waterloo plays Sunday night at home against Des Moines, and if they win that game, they will leapfrog the Stars into third place. Click here to view the current USHL standings. With Fargo's win tonight, the Stars cannot finish any higher than third place in the west. That means that Lincoln will either face the Fargo Force or the Sioux Falls Stampede in the first round of the USHL Clark Cup playoffs. The Stars will start that series on the road, since Fargo and Sioux Falls have the better record. Omaha got on the board first early in the first period at the 3:06 mark to take a 1-0 lead. Lincoln answered when Riley Bourbonnais knocked home a rebound at the 11:56 mark of the first to tie the game at 1-1. Omaha outshot Lincoln 12-7 in the first period. The Stars outplayed Omaha in the second period, but each team would score one goal a piece in the middle stanza. Lancers scored a shorthanded goal at the 8:54 mark of the second on a play that Stars goaltender Jackson Teichroeb will surely want back. Teichroeb came out of his net to play the puck, but instead of passing it behind him and around the net, he attempted to pass the puck through an Omaha player. The Lancers player knocked down the pass and fired the puck into the open net. Paul LaDue would even the score at the 12:57 mark of the second with a PP snipe, his 12th goal of the season. Lincoln outshot Omaha 17-6 in the second period. In the third, the Stars appeared to take the lead with a goal from Riley Bourbonnais, but it was waved off by USHL Ken Anderson. I'll post more about that controversial call below. Very late in the period, Omaha scored while the Stars were sleeping in their defensive zone to win the game. Lincoln outshot Omaha 32-29 through 60 minutes, but the Lancers would get the two points. Jackson Teichroeb stopped 26 of 29 in the loss, his first in six games played. Lincoln finished 1-for-4 on the powerplay. Tough loss, considering the missed goal, but the Stars picked up 2 of 4 points this weekend and clinched a playoff spot. Focus on the positives and finish strong next weekend against the Tri-City Storm. Note: Last night, I originally tried to embed a video from Facebook that a friend of mine posted of the disputed Stars goal in the third period that was called off. The audio from the video was from Dan Fremuth, who is the Omaha Lancers' radio announcer. In the video, Fremuth said that the puck clearly went over the goal line before the net came off the moorings. For some reason, Facebook wasn't allowing anyone to watch the video, so I had to take it down. I found the video below from the Lancers' Facebook page, and since it's a YouTube video, I was allowed to embed it. Go to the 1:35 mark of the video to see the play in the second period that Stars radio announcer Mike Melbye thought was a goal but later agreed it never crossed that line. Vinni Lettieri bats the puck out of mid-air and it bounces off of Cole Bruns, dances across the goal line, and hits the opposite post before getting cleared. It's was close, but definitely not a goal. The play that should have counted for a goal is at the 2:35 mark of the video. There's no audio here of Dan Fremuth or Mike Melbye both saying it should of counted, just crappy rock music. The shot by Riley Bourbonnais would have made the score 3-2 Stars in the third period. If it wasn't a goal, why did Omaha's own announcer, when watching it on replay, say it was clearly a goal? The video posted by the Lancers shows it for two seconds and that's it. It's not slowed down like the replay I saw. Regardless, the game is over. Omaha won, Stars lost. Lincoln will play postseason hockey, Omaha will play golf. 63.6 Awarded Goal - In the event that the goal post is displaced, either deliberately or accidentally, by a defending player, prior to the puck crossing the goal line between the normal position of the goalposts, the Referee may award a goal. In order to award a goal in this situation, the goal post must have been displaced by the actions a defending player or goalkeeper, the puck must have been shot (or the player must be in the act of shooting) at the goal prior to the goal post being displaced, and it must be determined that the puck would have entered the net between the normal position of the goal posts. It is clear from the replay that the goal should have been awarded.